We are delighted to publish the schedule for the Springtime Sessions, in partnership with the BIID, taking place from 26th – 28th March. Please see below for details on how to sign up to the individual events. All events are free to attend and you are welcome to come to as many events as you are able. Please note that a number of the events have limited space, so sign up early to guarantee your place. We will update this page, so please check back for further information on the events, or please contact chelseadesignquarter@gmail.com with any queries or to get involved. 9.30am – 11.30am – Tatiana Tafur presents “The Boss of Embossed comes to London.” Exploring the different applications of embossed leather in today’s interiors and looking into the skilled craftsmanship involved in creating these beautiful surfaces. Please rsvp to harriet@tatianatafur.com. 12pm – 2pm – John Cullen Lighting & Eggersmann Design present “Functional versus luxury kitchens: how to get it right” Sally Storey, Gary Singer and Staffan Tollgard in conversation with renowned interiors journalist Claudia Baillie. Please click here to RSVP. 2pm – 4pm – Roca London Gallery are hosting a two part event, guests are welcome to attend both or either. 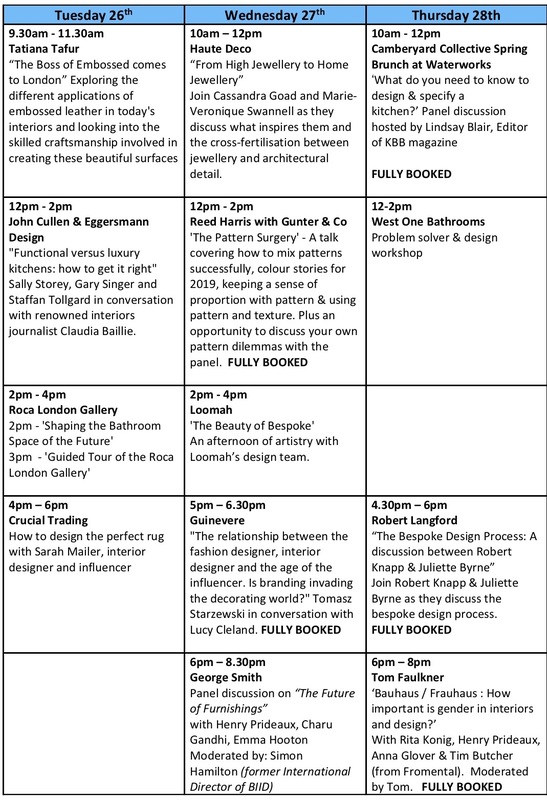 4pm – 6pm – Crucial Trading host ‘How to design the perfect rug with Sarah Mailer, interior designer and influencer’. Click here for more information and to RSVP. 10am – 12pm – Haute Deco present “From High Jewellery to Home Jewellery”. Join Cassandra Goad and Marie-Veronique Swannell as they discuss what inspires them and the cross-fertilisation between jewellery and architectural detail. Please RSVP to showroom@hautedeco.com. 12pm – 2pm – Reed Harris and Gunter & Co will be holding ‘The Pattern Surgery’. This event is now FULLY BOOKED. 5pm – 6.30pm – Guinevere will be hosting Tomasz Starzewski in conversation with Lucy Cleland discussing “The relationship between the fashion designer, interior designer and the age of the influencer. Is branding invading the decorating world?”. This event is now FULLY BOOKED. 6pm – 8.30pm – George Smith are holding a panel discussion on “The Future of Furnishings” with Henry Prideaux, Charu Gandhi & Emma Hooton Moderated by: Simon Hamilton (former International Director of BIID). Please RSVP via Eventbrite. 10am – 12pm – Camberyard Collective Spring Brunch at Waterworks. “What do you need to know to design & specify a kitchen?” Panel discussion hosted by Lindsay Blair, Editor of KBB magazine with Rebecca Weir from Light IQ; Karen Oliver, Interior Designer, Melissa White, Architect and Prinul Polessi Patel from Made in Chiswick. This event is now FULLY BOOKED. 12pm – 2pm – West One Bathrooms will be holding a problem solving and design led practical workshop. Please RSVP to events@westonebathrooms.com. 4.30pm – 6pm – Robert Langford presents “The Bespoke Design Process: A discussion between Robert Knapp & Juliette Byrne”. Join Robert Knapp & Juliette Byrne as they discuss the bespoke design process. This event is now FULLY BOOKED. Please contact chelseadesignquarter@gmail.com for waitlist. 6pm – 8pm – Tom Faulkner will be hosting: ‘Bauhaus / Frauhaus : How important is gender in interiors and design?’ A panel discussion with Rita Konig, Henry Prideaux, Anna Glover & Tim Butcher (Fromental) which promises to be a lively discussion on gender in design, hosted by Tom. This event is now FULLY BOOKED.